Today, I'm reviewing the comedy, The Odd Couple (1968), starring Jack Lemmon and Walter Matthau as battling roommates. This article is part of The Jack Lemmon Blogathon hosted by Critica Retro and Wide Screen World. Actor Jack Lemmon gave countless great performances throughout his long career, but he was never better than as newly divorced neurotic Felix Ungar in playwright Neil Simon's brilliant comedy, The Odd Couple (1968). The Odd Couple begins when Felix, who has just found out that his wife is leaving him, tries and fails to commit suicide by jumping out of the window of a dingy New York City hotel (he injures his back trying to open the window). The despondent Felix then heads to the apartment of his friend Oscar Madison (Walter Matthau), who offers him a place to live until Felix can get back on his feet. Soon, neat freak Felix and "divorced, broke, and sloppy" Oscar are clashing about everything from turning on the dehumidifier to linguine in clam sauce. The Odd Couple is an adaptation of Simon's hit Broadway play that starred Matthau as Oscar and The Honeymooners alum Art Carney as Felix. Paramount Pictures executives decided they needed a bigger box-office name to play Felix in the movie adaptation so they cast Lemmon, who had appeared so successfully opposite Matthau in writer and director Billy Wilder's satire, The Fortune Cookie (1966). 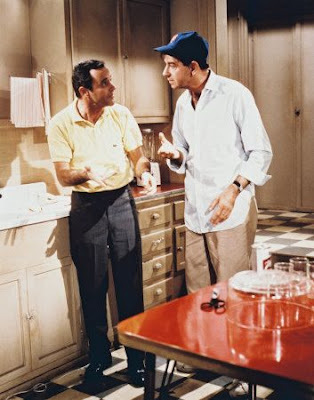 The result was a huge hit that established Lemmon and Matthau as a top screen team (the duo continued to make films together for the next 40 years), and made The Odd Couple a staple of pop culture. 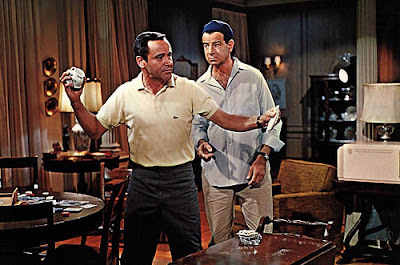 Simon's play spawned a 1998 sequel starring Lemmon and Matthau, three TV series, a Saturday morning cartoon, and countless theatrical revivals (at this point, I think every community theater in the U.S. has mounted a production of The Odd Couple). Jack Lemmon and Walter Matthau in a production still from The Odd Couple (1968). However, the remakes haven't tarnished the luster of the original film. It has a lot going for it, including a great cast. Oscar's poker buddies are played by familiar character actors like John Fiedler and Herb Edelman, and Monica Evans and Carole Shelley are unforgettable as the "cuckoo" Pigeon sisters, a pair of giggly English ladies who share a memorable double date with Felix and Oscar. There's also great location shooting in New York City. Viewers get glimpses of Time Square and its seedy back streets, Shea Stadium with Pittsburgh Pirates legend Bill Mazeroski at the plate, and the once ubiquitous NYC grocery-store chain Bohack. All that being said, the best recommendation for watching The Odd Couple is that it's hysterically funny, which is due in large part to Lemmon's precise characterization of Felix. 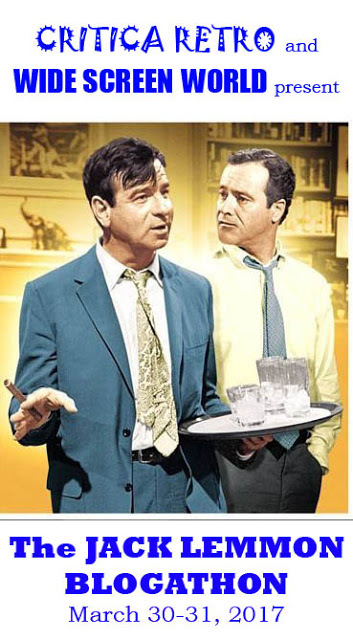 There's no question that Matthau does great work -- he plays Oscar's casual slobbishness to perfection -- but he is essentially the movie's straight man, who reacts with mounting dismay to Felix's array of nervous tics and neuroses. 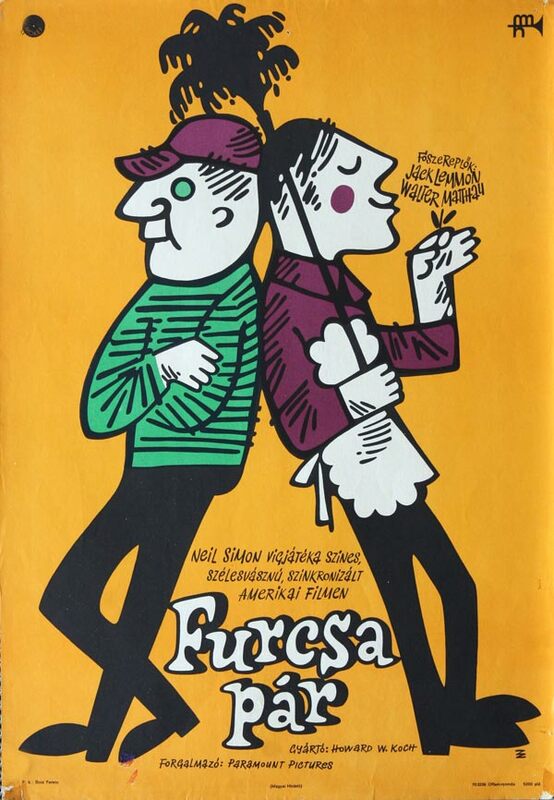 A vintage Hungarian poster for The Odd Couple (1968). Lemmon, who gives one of cinema's great comic performances, plays Felix as a tightly wound man who, when he's not in a nervous tizzy, is having weepy meltdowns while looking at photos of his wife and two children (Oscar jokes that Felix contracted bursitis by crying on his own shoulder). Felix is a hypochondriac with a catalog of symptoms that range from back spasms to, most memorably, sinusitis (clip below); he's also an obsessive-compulsive neat freak who vacuums and cleans like his life depends on it, and a meticulous cook. In one of The Odd Couple's most memorable scenes, Felix has a Defcon 5 level meltdown at the prospect of serving dry meatloaf at a dinner party. Both Lemmon and Matthau were nominated for Golden Globe awards for their performances, and they went on to appear in eight more films together, becoming one of cinema's great screen teams. The Odd Couple is available on DVD and video on demand. Such a funny movie. It made me happy reading your article. Love the poker scene especially. All those actors working with such precision and art. The scene where they try to keep Felix from committing suicide had to be so well-rehearsed to get all of the camera angles and blocking right, but it appears so spontaneous onscreen. 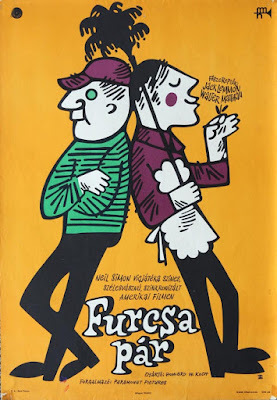 That Hungarian poster is a great find. The Odd Couple must be popular in Hungary. I googled the title and it is showing in movie theaters in Budapest. This is such a wonderful film, and also a great review! Matthau and Lemmon's chemistry is undeniable - comedic gold! They were of cinema's great comic teams. The great thing about this movie is that, when it ended, I wanted more! So there's no wonder it evolved into TV series and even cartoons. It is a great movie, and yours was a neat and complete review - Felix would be happy with it! I agree. I put the TV series on hold at my local library. I didn't realize they had turned "The Odd Couple" into a cartoon. That says a lot about this concept. Lemmon and Matthau are fabulous, but I agree that Lemmon's neurotic performance really drives this film. He is so tightly-wound that the comedic possibilities are endless. You've got me wanting to see this film again! Felix is terrified of/neurotic about everything so the possibilities are endless. Jack makes a great Felix. Thanks for submitting to The Classic Movie Marathon link party. I appreciate it.